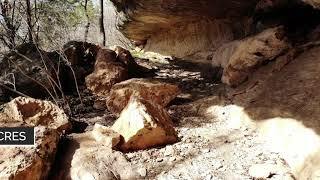 Indian Cave Ranch represents some of the highest elevation acreage Bosque County has to offer. Have a bonfire with family and friends in your own cave and natural rock fireplace that you won&apos;t find anywhere else! Make this your primary residence or a great weekend getaway with a 2,721 sq ft, 3 BR/2 BA home, just 1 hour and 40 minutes from DFW metroplex or 30 minutes from Waco. Tucked back on the very private FM 3315 with limited neighbors. The county road frontage allows ease of access, while the surrounding large parcels create a sense of privacy. Amongst the rock cliffs and canyons, this property includes open meadows with good soil that produce strong native grasses good for livestock or food plots. The tree cover, and terrain create a great wildlife habitat and hunting opportunities for deer, turkey, hogs, ducks, dove and varmints. Property currently used to raise goats on ag exempt acreage with excellent fencing. Several additional sheds used for pottery making, tobacco drying and storage. This property is exclusively listed by Tyler S. Blair of Clayton-Waggoner Properties, LLC. Any and all information contained herein has been obtained from sources deemed reliable by Listing Broker. Listing Broker does not warranty or guaranty the accuracy of the information. Located 5 miles southeast of Clifton. From Clifton, head northeast on FM 219. Turn right onto FM 708 and then continue onto River Rd/CR 3310. Turn left onto CR 3315, entrance will be .5 miles on the right.